The Tories have unleashed the biggest assault on ordinary people for generations. It needs to be met head-on. The People’s Assembly Against Austerity is a key opportunity to bring together all those who want to stop the cuts and the ­devastation they are bringing to millions of people in the UK, and to launch the next steps in the fightback. 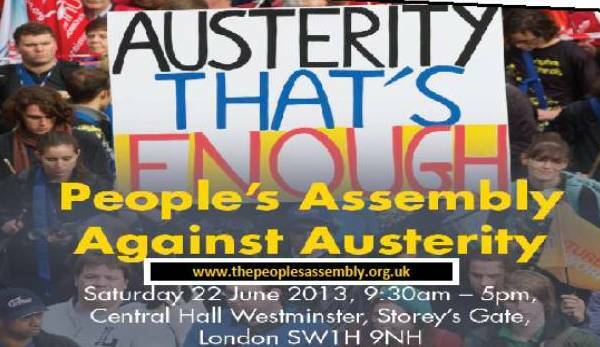 The People’s Assembly Against Austerity was launched with a letter to the Guardian on February 28th 2012. Two of the initial signatories were Caroline Lucas MP and Natalie Bennett. The Green Party had voted at their conference in February to support the event and agreed to send a delegation to the People’s Assembly and to encourage local parties, regional federations and other GP bodies to also send delegations and to support future local People’s Assemblies. 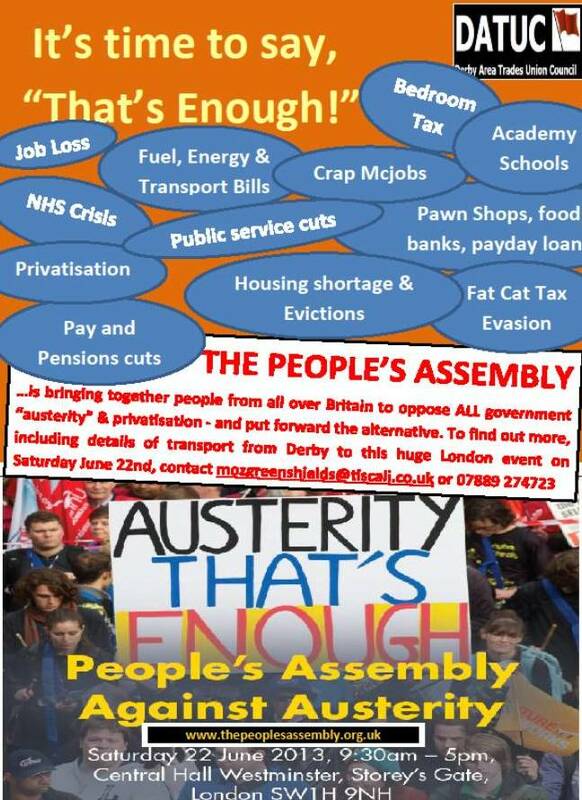 Derby People’s Assembly – A new local “networking” group has been formed in Derby made up of individuals and people representing local groups concerned with issues such as Climate Change, Taxation, NHS etc. Two Green Party Members attended the initial meeting. The aim of the meeting was twofold: to publicise the national gathering in London on 22nd June and to arrange a follow up event in Derby in the Autumn. The time has come for us, the People, to make our voice heard. We are a democracy. We must demand that the Government uses the power and money we give it to serve our interests, and not just those of the wealthy vested interests that are controlling politics. Austerity will never succeed because the economic crisis was not caused by public spending. We must demand that the government we elected adopts policies that address the causes of the financial crisis. We must demand that they invest in our future to build a sustainable economy. We must make it clear that if this Government will not listen to us, we will elect one that will. This entry was posted in Climate Change, Community, Derbyshire County, East Midlands, Economy, Education, Energy, Environment, Equality, Housing, National, Parliament, Public Services, Transport, Youth and tagged austerity, Caroline Lucas, change, cuts, democracy, Derby, Derbyshire County, Economy, Education, Environment, Green Party, housing, jobs, People's Assembly, public services, public transport, students. Bookmark the permalink.